Well, it finally happened. On my hiking stick page, I mentioned that some day I'll start using hiking poles when someone gives me a pair for Christmas or birthday. They did. My sons got me these Outdoor Products trek poles for Christmas and today I tried them out for the first time. Felt kind of like a 2-month old golden retriever stumbling along. I hit my foot with the pole a few times. I kicked the pole with my foot a few times. The tips skidded on the ice a few times. Now, don't think I'm complaining here - I'm just letting you know that there's a short learning curve for any new piece of gear and gear should be used as it's needed. Today's hike was completely flat on a rails-to-trails style path. There was no need for the extra push or support from the poles - I was just taking them out for a spin. On a long hike over a stretch like this, I plan to just compress the poles and hook 'em on my pack. When I start my hilly practice hikes, I'll tell you more about how helpful I find these poles to be. Today, I'm letting you know what we've got here. These Outdoor Products poles are aluminum with rubber handles and cam-locks. I like how the locks flip and hold rather than screw. There are three sections to the pole so they compress down to 25 inches which makes stowing on a pack pretty easy. The sections come completely apart so I really have 6 short aluminum tubes for emergency improvization. After removing the rubber foot and basket, they weigh 9.7 oz. each. You can find lighter poles. I'll let you know how it feels to carry a half pound in each hand all day later. The handles feel good to me, but the dense plastic makes them heavy. The shafts range from 25 inches compressed to 54 inches completely extended. They have carbide tips, baskets that easily unscrew, and rubber foot covers. I'll be using these as tarp supports on my long hikes and they seem solid enough for that extra work. Oh, I also like the metallic green color - fits my style more than a bright red or orange pole. At first sight, I think I got a great present here! 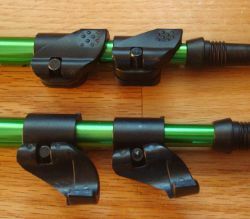 I believe they're a good item for folks like me that haven't used trek poles before and are learning how it all works. Someone with more $$$ and experience with poles coulde easily spend more than the $30 these cost and get poles that weigh half as much. If you haven't already look at a youtube of "nordic walking" with info on how to use the straps (like a cross country skier would) so the pressure is on your wrist, your fingers won't get tired gripping the poles. Angle the poles back as they contact the ground and you can get significant push on uphills and flats. Of course angle forward on downhills for stability and shock absorption. I use mine with a LightHeartGear tent. Based on what I see on your site you will have no problem doing the AT (unless you get norovirus!). Great presentation.